A book is not always a book, and a reader is not always a reader. Sometimes a book is a film—and a film projector. Sometimes a reader is a moviegoer—and a film projectionist. Our page turning sets images in motion, pulling us back into the tactile relationship to print we had as children. Or into work that has fallen into history, like the labor of film projectionists rendered obsolete by technological change. 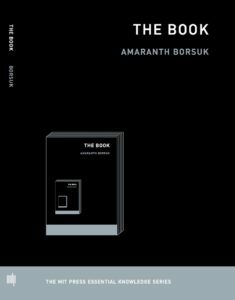 When the book is a film, then, it embodies more than a relationship between mediums, more than a mix-up of technologies variously textual and visual. It also materializes a relationship to time. It materializes historical experience in the tempos where mediums meet as we turn the book’s pages: sometimes slower, sometimes faster, sometimes bookishly, sometimes cinematically—but always historically. The book is the place where we are always in history, paging our way through time. Joel Burges is Associate Professor of Media Studies at the University of Rochester. He has written extensively on time, obsolescence, and labor in contemporary culture and critical theory, turning to mediums as varied as the mimeograph, animation, film, television, video games, and the book. He has published Out of Sync & Out of Work: History and the Obsolescence of Labor in Contemporary Culture (Rutgers UP, 2018) and co-edited, with Amy J. Elias, Time: A Vocabulary of the Present (NYU Press, 2018). He is at work on Literature after TV, a history of how the rise of television transformed the practice of literary writing in the 20th and 21st centuries.